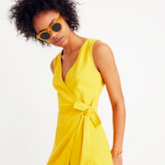 yellow side-tie dress $88 – the sweetest yellow mini dress. love how structured it is, feels very 60’s. daisy mini skirt $88 – a super lightweight mini skirt to wear with all your favorite t-shirts. apron tie-waist dress $145 – shoulder bearing, soft and feminine. wrap-front romper $148 – rompers are great for more active summer adventures that might not be too dress friendly. apron mini dress $118 – a crisscross back and a simple black + white stripe makes this super easy to wear and dress up or down. 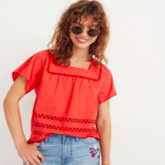 eyelet top $68 – you can never go wrong with eyelet in the summer. and this one gives you lots of breathing room. yellow silk dress $150 – a sweet, almost 40’s inspired dress, love the sleeve detail and simple pattern. knit pencil skirt $60 – i dig this whole matching set. easy to wear, simple and fun. silk slip dress $150 – nothing sexier or easier to wear than a simple slip dress. love this peachy hue!